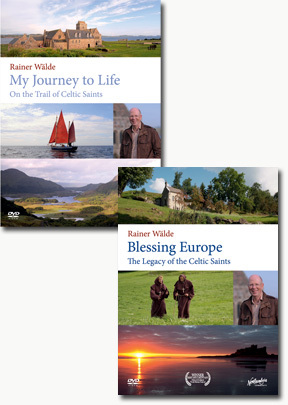 Blessing Europe - Join Rainer Wälde as he sets out on a fascinating journey through Europe on the trail of the Celtic saints. Discover the origins of Christianity in Ireland and journey with the Irish monks as they embark on their great adventure through France, Germany, Austria, Switzerland, and Italy. Following the success of his multi-award-winning documentary film, My Journey to Life, Rainer tells the stories of four major Celtic saints, with narration by Roy Searle of the Northumbria Community. Set out with Columbanus, regarded by some as the ‘first European’, on his incredible journey that will take him from Bangor in Northern Ireland to Bobbio in Italy. Relive the story of his companion, Gallus, who founded a monastic cell on the banks of Lake Constance out of which emerged a great religious and cultural centre that became the present day town of St. Gallen. Receive fresh inspiration from the beautiful music and soul-stirring prayers of the Celtic tradition. Discover the great legacy of the Irish monks and accompany Rainer on a moving journey to the source of life. My Journey to Life - Journey back in time to the origins of Christianity in Ireland and Britain. Travel from Dublin to Lindisfarne and find out about St. Patrick, Columcille, Brigid, Aiden and Cuthbert. Be inspired by the many ancient prayers, songs and rituals. Discover how a daily rhythm of life -- with set times for solitude and for Christian Communion --benefit our spiritual well-being. Explore how a spiritual life following the course of nature and admiring creation can help us to draw near to God.